To most, Kenneth Rexroth’s influence is confined to the literary realm. Seeing as his work proceeded and inspired the Beat Generation poets of the 1950s, this isn’t all that surprising. And yet, the first edition of his autobiography ends when he is just 22, and a full 13 years before his first poetry collection was published in 1940. In this Episode of Talking Hoosier History, we’ll explore the Midwest roots of this literary icon and his connections with anarchists, burlesque dancers, criminals, and the leading thinkers of his age. Lindsey Beckley: Hello and welcome to Talking Hoosier History this episode features the 2016 and 2017 Indian poet laureate Shari Wagner reading the works of Kenneth Rexroth. This podcast is brought to you by the Indiana Historical Bureau. For over a century, we’ve been marking Hoosier History. Now it’s time to start Talking Hoosier History. I’m your host, Lindsey Beckley. Voice actor reading Rexroth: My mother was well past her time. She was sitting in a cabaret, eating breast of chicken on whole-wheat bread with a piece of lettuce and drinking a glass of champagne, as she always did in cabarets, and wondering when I was going to show up when she began to feel labor pains. My parents were visiting in Elkhart, but they had the curious idea of hurrying up to Chicago for the baby’s birth. My mother was taken off the train in South Bend, and I was born there. Beckley: That scene, so rich in detail for an event Kenneth wasn’t even around to witness, is fairly typical for his autobiographical novel. While many of the broad strokes of his story can be corroborated with primary sources, some of these finer details we just kind of have to take his word on. Something to keep in mind when I refer back to his autobiography. The Rexroth family; Charles, Delia, and Kennethenjoyed an upper middle class lifestyle in the early years of Kenneth’s life. They lived first in a house on Park Avenue in South Bend, described as “substantial and comfortable” and later, on Beardsley Avenue in Elkhart, where “all the best homes in the town were in those days.” Charles worked as a traveling pharmaceutical salesman and Delia began to see to Kenneth’s education, and something she did quite enthusiastically. According to Rexroth, she taught him to read between the ages of three and four, and he had read 100’s of books, including Charles Dickens, at an early age. This early influence of his mother was a lasting one; he was a prolific reader for the rest of his life. Circumstances soon changed for the small family, though. Charles suffered from alcoholism and Delia from a an unknown chronic illness. Charles’ drinking and Delia’s illness had a deteriorating effect of the couple’s relationship. When Rexroth was 9, the family moved briefly to Battle Creek Michigan, then to Chicago the following year to live with relatives. Around this time, Charles’ alcoholism had him on death’s doorstep and he left the family, likely going to some sort of sanitarium for treatment. Rexroth and his mother moved into a small apartment and rarely saw Charles. In 1916, Delia succumbed to what was most likely tuberculosis. Even in her last days, she was a positive influence in Kenneth’s life, stressing the importance of never allowing anyone to deter him from becoming an artist and writer. After his mother’s death, Rexroth went to live with his father and grandmother in Toledo, Ohio. Here, Rexroth began to seek trouble, and with little adult supervision, there was plenty of trouble to be found. In Toledo, he ran errands for brothels and sold popcorn to the working girls. Although he was only 11, he frequented burlesque shows and set up side hustles all over the city. He ran with a gang of other boys, who did “a regular business in hot bicycles and automobile accessories” and spending their days “drinking homemade beer [they] had stolen from [their] parents cellars.” During this time he also witnessed the violent and deadly Willys Overland strike of 1919, a conflict where young Rexroth stood firmly on the side of the workers and which he considered his introduction to the labor movement. In that same year, perhaps when Rexroth most needed an authority figure in his life, his father succumbed to his alcoholism. The 15 year old, now orphaned, Rexroth went to Chicago to live with his aunt. He enrolled in Englewood High School but, by his own account “had become a consummate master in the art of plausible hooky” and was soon expelled for his poor attendance. That was the end of his formal schooling, but he found a much more profound education awaited him outside the confines of the classroom. Beckley: He gained access to the clubs of poets and writers gathered in Chicago during the second wave of the Chicago Literary Renaissance. His favorite of these was the Washington Park Bug Club. Also known as Bughouse Square, this club was a widely recognized center of free speech and Rexroth encountered radical political views of all types at the meetings held there. While Bughouse Square expanded Rexroth’s political horizons, the amusingly named Dill Pickle Club helped him develop artistically. The Club hosted independent theater productions, lectures on various topics, and, on Saturday nights, the Jazz music and dancing lasted all night long. In these Chicago cultural hotspots, Rexroth started performing his poetry and rubbed elbows with political and literary giants. Rexroth soon outgrew the “hustles” he ran as a youth and began working odd jobs. One of these jobs was at the Green Mask. There, Rexroth was able to see and perform poetry with some of the era’s best poets and jazz musicians, eventually combining the two art forms into what would later be recognized as jazz poetry. However, the club was raided by police and the owner arrested for being the “keeper of a disorderly house.” Rexroth was arrested in the same raid and sentenced to a year in jail. He emerged after a winter in The Chicago House of Correction having grown “a little closer to the underworld,” as he put it. In late December 1926, after months spent pursuing various young women, Rexroth met the artist Andrée Schafer through friends. Although they had met just briefly, Rexroth pronounced that he intended to marry her afterwards. After just a few weeks, that pronouncement came true and the two were wed. Soon after, the couple left Chicago for a new life on the West Coast. After arriving in San Francisco in the summer of 1927, Rexroth wouldn’t just experience a cultural Renaissance, he would create one. But before we get to that, let’s pause for a quick break. Beckley: Since you’re listening to this, chances are, you love Hoosier history just as much as we do. If you’re interested in conducting your own research, but don’t know where to start, check out Hoosier State Chronicles, Indiana’s digital historic newspaper program, at hoosierstatechronicles.org. The project is operated by the Indiana state library with financial support from the US institute of museum and library services, along with the National Endowment for the Humanities National Digital Newspaper program. You’ll find many great resources at Hoosier State Chronicles. You can explore yesteryears newspapers at your fingertips at Hoosierstatechronicles.org. Now, back to the show. Beckley: Upon their arrival on the West Coast, Kenneth and Andree found exactly what they had hoped for: a rich cultural environment without the stuffiness they had sensed in the East Coast artistic communities. They settled into the San Francisco art community, living what he called “a sort of semi-monastic life devoted to writing and painting.” The duo also took time to explore the unique flora and fauna of the area surrounding them, feeding Rexroth’s love for nature. This deep seated respect for the natural world influenced Rexroth’s writing and by the mid-1930s his poetry was gaining notoriety for combining natural imagery with his radical political and anti-war sentiment. While he was being published more and more regularly, it wasn’t enough to fully support the couple, even in their semi-monastic lifestyle. So, in the midst of the Great Depression, Rexroth was employed by the Work’s Progress Administration’s writing program. These paths, ten years together. We thought would not come for us are here. Beckley: The idea expressed in that excerpt, that love and nature could serve as spiritual refuge in troubled times, became more poignant with the outbreak of the US entry into World War II the attack on Pearl Harbor in 1941. Rexroth maintained his pacifist, anti-war stance and applied for Conscientious Objector status in 1943. He backed his beliefs with action by working with several pacifist groups and organizations providing aid to camps of conscientious objectors. He took his activism further by stepping in to help Japanese Americans avoid internment after President Roosevelt issued Executive Order 9066, authorizing the relocation of Japanese Americans away from the West Coast to internment camps in the interior of the nation. Rexroth explained how he and Maria had saved several Japanese-Americans from internment in his autobiography. He recounted that he contacted the Midwest Art Academy in Chicago, a school which he called a phony correspondence school. He convinced the school to sign registration papers for Japanese American students for a fee. He then contacted the colonel in charge of the “evacuation” in San Francisco, who agreed to provide educational passes for these students. Rexroth wrote, “We started shoveling people out of the West Coast on Educational passes.” Since no official records were kept of this, it’s hard to say how many people were saved in this way. But the fact that the operation happened was corroborated by colleagues of Rexroth. Rexroth incorporated his strongly held beliefs about pacifism, nature, and the power of love into his writing. In his 1944 work, the Phoenix and the Tortoise, he pondered the horrors of the recent war and holocaust but still maintained hope for humanity despite its failings. The end of the war saw an influx of new artists and writers into the San Francisco area. Rexroth himself believed that their arrival was a direct result of the war itself. In the San Francisco Magazine, he wrote, “Just as London under the buzz bombs enjoyed a literary renaissance and a profound change of social relationships…so San Francisco during the War woke up from a long provincial sleep and became culturally a world capital.” Rexroth became the architect of that cultural world capital by hosting weekly gatherings at his home where he introduced poets to each other and hosted readings. Much like the Chicago Renaissance, the budding San Francisco Renaissance combined political discussion, poetry, and jazz. Over the next decade, the foundation laid by Rexroth gave rise to the Beat Generation and although Beat poetry was being produced on the east coast as well, San Francisco was the heart of the movement in the early 1950s. The Beat Generation, much like Rexroth himself, rejected mainstream culture and politics and expressed themselves through new and non-conventional forms of poetry. One of those non-conventional forms of poetry was another hold over from his days in Chicago; jazz poetry. Rexroth was gaining fame for this form of poetry at this time and was integral in establishing jazz as an essential element of Beat poetry. He concluded with imagery of the ocean as sanctuary, and the love of his wife as sublime, cleansing, saving, and immortal. Again, Shari Wagner reading Rexroth, edited for length. Myself as act, as immortal person? Of ten thousand thousand years. Voice actor reading from Rexroth: Just as London under the buzz bombs enjoyed a literary renaissance and a profound sense of change in social relationships, so San Francisco during the war woke up from a long, provincial sleep and became culturally a world capitol. Beckley: And Rexroth became the architect of that cultural world capitol by holding weekly gatherings where he hosted readings and introduced poets to each other. Much like the Chicago renaissance, the budding San Francisco renaissance combined political discussion, poetry, and jazz. Over the next decade, the foundation laid by Rexroth gave rise to the Beat generation. And while Beat poetry was being produced on the East Coast as well, San Francisco became the heart of the movement in the early 1950s. The Beat Generation, much like Rexroth himself, rejected the mainstream culture and politics and expressed themselves through new and non-conventional forms of poetry. One of these non-conventional forms of poetry was decendend from Rexroth’s days in Chicago: Jazz Poetry. He was gaining fame for this kind of poetry at the time and was integral in establishing jazz as an element of Beat poetry. This melding of jazz and poetry can be heard in this clip from the Black Hawk in 1955. Recording of Rexroth: We were falling like meteor. Down two black holes toward each other. Then compact, blazing through air into the earth. Beckley: Scholars point to this as a culminating event of the San Francisco Renaissance and solidification of the Beat movement. This resulted in his gaining the title “Father of the Beat Poets,” a title he eventually rejected. Ultimately, he rejected the movement as a whole, claiming that it had turned from a literary movement into a “hipster lifestyle” of pursuing fashionable trends rather than larger truths and he distanced himself from it. Eventually, the Beat movement melted into the counterculture movements of the sixties and rock and roll replaced poetry and jazz as the dominant outlet for rebellious youth. Nonetheless, Rexroth continued to be a central figure in American literature. He continued writing poetry as well as cultural and literary criticism and began dedicating more of his time to translating poetry from other languages, primarily Japanese and Chinese. He paid special attention to translating the works of women poets starting in the 70s, a practice which has a lot of influence on his own original works from that time. It’s hard to summarize such a complex individual with such varied interests. 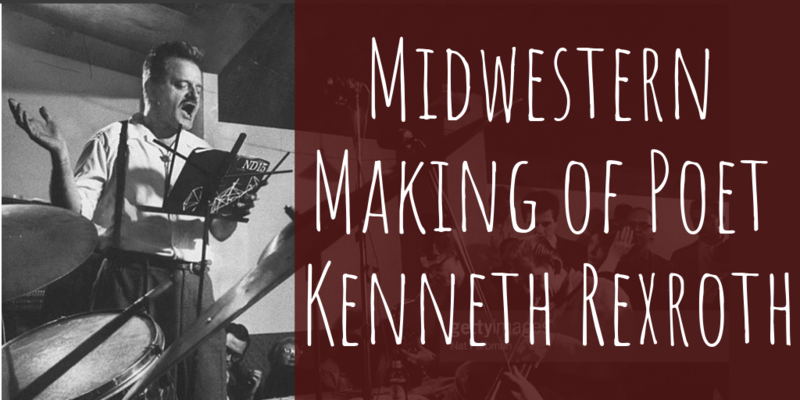 After his death in 1982, Kenneth Rexroth received acclaim from both mainstream and radical literary circles. While he’s probably best known for the influence he had on the voice and worldview of some of the country’s best poets, it’s his own unique voice that will forever hold his place in America’s literary cannon. Beckley: Once again, I’m Lindsey Beckley and this has been Talking Hoosier History. If you’re interested in learning more about this topic, visit Blogging Hoosier History to read the two part post by Jill Weiss. Her research for the Indiana state historical marker formed the basis of this episode. And thanks again to the Indiana poet laureate Shari Wagner, who read the poems in this episode. If you would like to hear more from Shari, visit our website, in.gov/history/talkinghoosierhistory. As usual, thanks to Jill for engineering the sound and Justin Clark for lending his voice to this podcast. 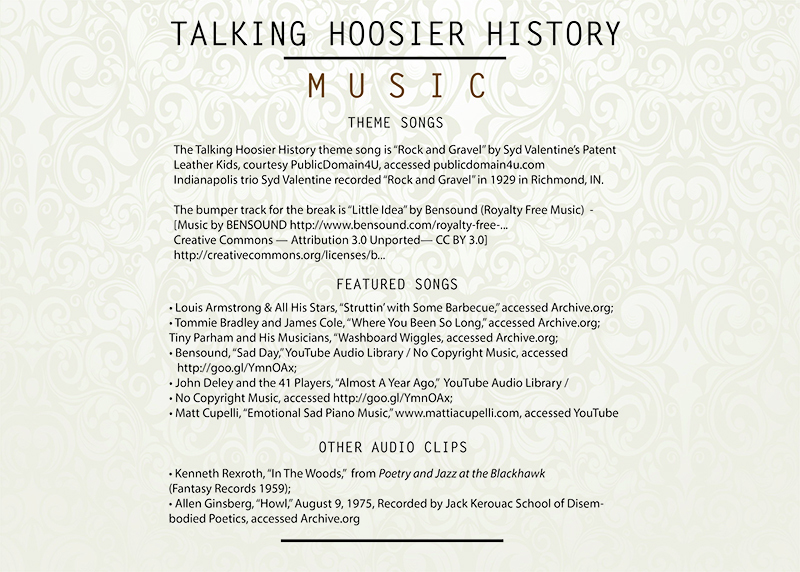 Follow us on our brand new Facebook and twitter accounts, both at @TalkingHoosierHist, that H-I-S-T. And finally, please subscribe, rate, and review Talking Hoosier History on iTunes, stitcher, soundcloud, or wherever you get your podcasts. Thanks for listening! Kenneth Rexroth, A Life of Kenneth Rexroth: An Autobiographical Novel, (Garden City, New York: Doubleday & Company, Inc., 1966). Linda Hamalian, A Life of Kenneth Rexroth, (New York: W. W. Norton & Company, 1991). Kenneth Rexroth, The Phoenix and the Tortoise, (Norfolk, Connecticut: New Directions, 1944). Jill wrote the blog posts “The Midwestern Making of Kenneth Rexroth: Robbing Cash Registers and Reading the Classics” and “Kenneth Rexroth: Poet, Pacifist, Radical, and Reluctant Father of the Beat Generation” which formed the basis of the research for this episode. Jill is the Digital Outreach Manager for the Indiana Historical Bureau. She also serves as the recording engineer, editor, and general master of the recording room. Justin is a project assistant with the Hoosier State Chronicles newspaper digitization project. In this episode, he read for Kenneth Rexroth. If you’re interested in reading historical newspaper articles, visit Hoosier State Chronicles online. Shari is the 2016-2017 Indiana Poet Laureate. In this episode, we were honored to have Wagner read excerpts of poetry by Kenneth Rexroth.